The Proceedings of the Coinage of the Americas Conferences (COAC) consist of formal scholarly versions of the papers presented in the Society’s annual COAC. COAC was initiated by Harry W. Bass, Jr., (ANS President, 1978–84) as a means of increasing the Society’s involvement with Western hemisphere coinage, currency, and related fields. 1985. America’s copper coinage, 1783-1857. Coinage of the Americas Conference Proceedings, no. 1. New York: American Numismatic Society. 1985. America’s currency, 1789-1866. Coinage of the Americas Conference Proceedings, no. 2. New York: American Numismatic Society. 1987. America’s silver coinage, 1794-1891. Coinage of the Americas Conference Proceedings, no. 3. New York: American Numismatic Society. Stahl, Alan M., ed. 1988. The medal in America. Coinage of the Americas Conference Proceedings, no. 4. New York: American Numismatic Society. Bischoff, William L., ed. 1989. The coinage of El Perú. Coinage of the Americas Conference Proceedings, no. 5. New York: American Numismatic Society. Metcalf, William E., ed. 1990. America’s gold coinage. Coinage of the Americas Conference Proceedings, no. 6. New York: American Numismatic Society. Kleeberg, John M., ed. 1992. Money of pre-federal America. Coinage of the Americas Conference Proceedings, no. 7. New York: American Numismatic Society. Kleeberg, John M., ed. 1994. Canada’s money. Coinage of the Americas Conference Proceedings, no. 8. New York: American Numismatic Society. Kleeberg, John M., ed. 1995. America’s silver dollars. Coinage of the Americas Conference Proceedings, no. 9. New York: American Numismatic Society. Doty, Richard G., ed. 1995. The token: America’s other money. Coinage of the Americas Conference Proceedings, no. 10. New York: American Numismatic Society. Mossman, Philip L., ed. 1996. Coinage of the American confederation period.Coinage of the Americas Conference Proceedings, no. 11. New York: American Numismatic Society. Kleeberg, John M., ed. 1998. America’s large cent. Coinage of the Americas Conference Proceedings, no. 12. New York: American Numismatic Society. Stahl, Alan M., ed. 1999. The medal in America, volume 2. Coinage of the Americas Conference Proceedings, no. 13. New York: American Numismatic Society. Kleeberg, John M., ed. 2000. Circulating counterfeits of the Americas. Coinage of the Americas Conference Proceedings, no. 14. New York: American Numismatic Society. Doty, Richard G. and John M. Kleeberg, eds. 2006. 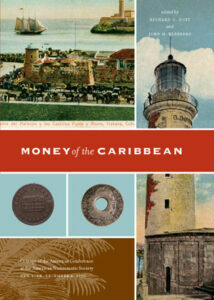 Money of the Caribbean.Coinage of the Americas Conference Proceedings, no. 15. New York: American Numismatic Society. Hoover, Oliver D., ed. 2009. Newby’s St. Patrick Coinage. Coinage of the Americas Conference Proceedings, no. 16. New York: American Numismatic Society.